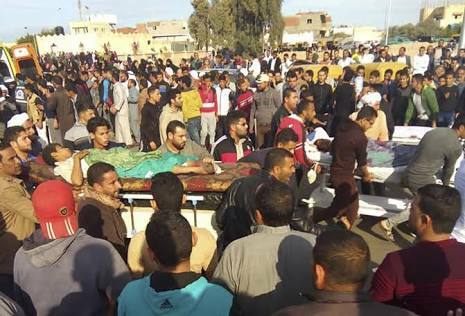 Egypt's chief prosecutor on Saturday raised the death toll to 305 from a cold-blooded attack by dozens of militants — some carrying Islamic State flags — on a mosque in the country's troubled northern Sinai region. Nabil Sadeq said 27 children were among the dead and more than 125 people were injured in the attack during Friday prayers. In the highly coordinated assault, more than 25 militants, some wearing fatigues, black T-shirts and masks, descended on the mosque in the small town of Bir al-Abd in five all-terrain vehicles, taking up positions outside the main door and around the 12 windows before opening fire. Witnesses said gunmen detonated a bomb at the end of prayers and then opened fire as people tried to flee, Reuters reported. The gunmen even fired on ambulances and set cars on fire to block roads, witnesses said. The prosecutor's statement, which dramatically raised the earlier death toll of 235, quoted survivors saying attackers not wearing masks sported heavy beards and long hair. Friday’s assault was the first major militant attack on a Muslim congregation in Egypt, and eclipsed past attacks, even dating back to a previous Islamic militant insurgency in the 1990s. The mosque is frequented by Sufis, members of a mystic movement within Islam. Islamic militants, including the local affiliate of the Islamic State group, consider Sufis heretics because of their less literal interpretations of the faith. Although no group has claimed responsibility for the attack, the Egyptian air force destroyed vehicles purportedly used by the terrorists to execute the attack and killed some of the militants. President Abdel-Fattah el-Sissi vowed the attack “will not go unpunished” and that Egypt would persevere in its war on terrorism. Army spokesman Tamer El-Refaie issued a statement saying terrorist hideouts were also targeted by the forces. In an official statement issued within hours of the attack, he said "law enforcement forces in North Sinai remain in cooperation with the air forces to comb terrorist hideouts and find and eliminate the rest of extremists," Al-Ahram, the government-opened daily newspaper, reported. The Egyptian military and security forces have long waged a tough campaign against militants in the towns, villages and desert mountains of Sinai, and Egypt has been in a state of emergency since April. Across the country, thousands have been arrested in a crackdown on suspected Islamists as well as against other dissenters and critics, raising concern about human rights violations. Seeking to spread the violence, militants over the past year have carried out deadly bombings on churches in the capital of Cairo and other cities, killing dozens of Christians. The Islamic State affiliate is also believed to be behind the 2016 downing of a Russian passenger jet that killed 226 people over Sinai. The chief prosecutor’s statement offered the most detailed account of the cold-blooded assault on worshippers, the deadliest by Islamic extremists in Egypt’s modern history. Witnesses also offered graphic details of the assault in interviews with The Associated Press on Saturday in the Suez Canal city of Ismailia, where some of the wounded are hospitalized. 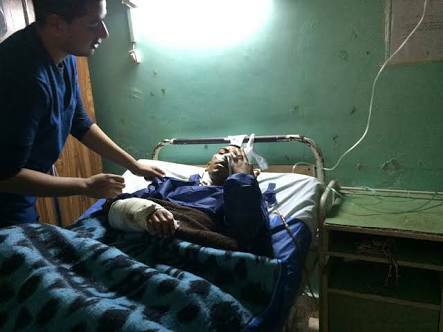 Sulieman Awad receives medical treatment at the hospital. They said the attack lasted some 20 minutes, with militants calmly firing on worshippers, driving many to jump out of windows or stampede into a corridor. One witness, Ebid Salem Mansour, said the imam had barely made it atop the mosque pulpit to deliver the sermon when intense gunfire rang out. Mansour, a 38-year-old worker in a nearby salt factory, suffered two gunshot wounds in the legs. He told the Associated Press that worshippers fell to the floor and kept their heads down. The militants shouted "Allahu Akbar," or God is great, and children screamed, Mansour said.